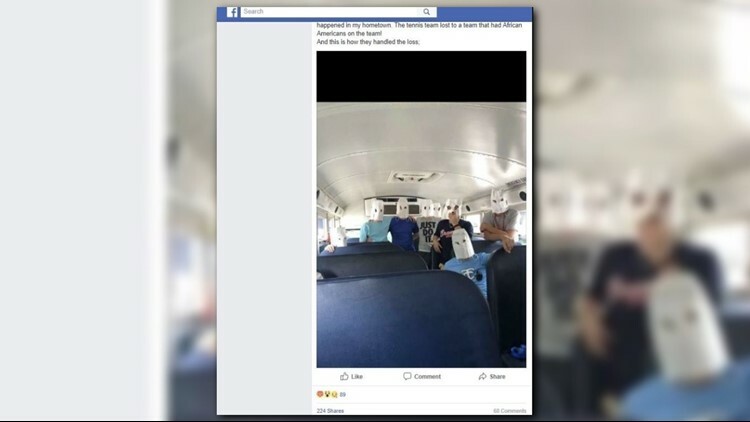 A photo that's been circulating on Facebook shows Telfair County students with white bags over their heads and eyes cut out -- similar to white hoods. Telfair County's school superintendent says he plans to discipline several tennis team members who posed in a racist photo. Viewers shared a photo with 13WMAZ that seemed to show students with white bags over their heads and eyes cut out -- similar to white hoods. The photo was reportedly taken last week after Telfair County High School's tennis team lost in a state tournament in Rome to a team that included black members. Telfair Superintendent Lenard Harrelson called the photo "highly offensive." He said he learned about the picture on Tuesday, May 15 and began investigating. "We are in the process of finishing up the investigation and disciplining those students involved," he said Thursday afternoon. Harrelson declined to answer further questions about the matter, including how many students were involved and how they'll be punished. He said he was consulting a school district lawyer about how much information he could release on the case. The photo reportedly originated on the Snapchat social-media app and spread around the area by Facebook.